After Hurricane Katrina, Paul Villinski, a well-known New York-based artist, wanted to transport his studio to Louisiana to see the aftermath first-hand and create artwork in response. At the time he didn’t have a way do it, but since then has picked up a 30′ trailer, gutted it, and rebuilt it to be green, non-toxic and off-grid. The Emergency Response Studio is now a totally self-sufficient traveling artist studio outfitted with solar panels, a wind turbine, non-toxic furnishings, and plenty of space to create. This is exactly the kind of trailer the government needed after Hurricane Katrina, rather than the 100,000+ trailers built by Gulfstream for FEMA. As you may remember, the use of the FEMA trailers was quite a fiasco in 2007. And even though FEMA was providing emergency shelter for victims of Hurricane Katrina, the trailers contained more than 75 times the acceptable limit of formaldehyde for US workers, causing many residents to get sick and at least one person died. This Gulfstream “Cavalier” wasn’t one of those FEMA trailers, but was very silimar and bought at an auction from the US Fish & Wildlife services for $5,015. Villinski tried to buy a FEMA trailer, but they had already taken them off the market. 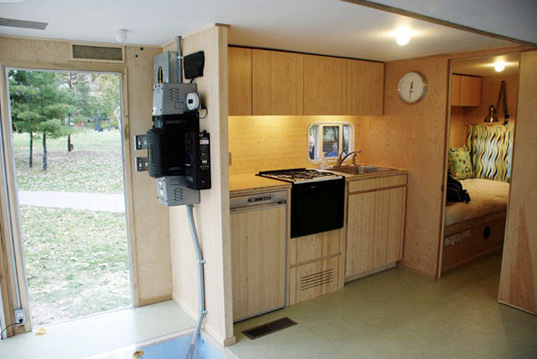 Villinski’s high tech, mobile studio is outfitted with a 1.6 kW solar system, with 8 batteries mounted under the trailer on the frame. The batteries together weigh 1,300 lbs and can be seen underfoot through a lucite cover, while the micro wind turbine is mounted on a 35′ mast. 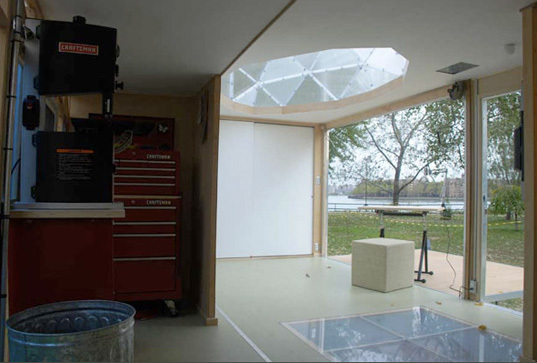 The studio features a geodesic skylight for daylighting and head room in the work area, and a side wall lowers down to become a deck. Recycled Kevlar sails were sewn together to create a shade awning that can also be used to collect rainwater. Non-toxic materials were used everywhere to replace the original formaldehyde-laden interior. Wood for framing was sourced from a local building materials recycler. Bamboo plywood was used for the cabinetry and natural linoleum was used for the flooring. The roof, floor, and walls were insulated with recycled denim or non-toxic mineral wool insulation. And all finishes were either low VOC or no VOC. The Emergency Response Studio will be on exhibition in New Orleans starting November 1st for the Prospect .1 New Orleans show featuring contemporary art from international artists. The show aims to revitalize the city by establishing New Orleans as a center for contemporary art, showcasing historical architecture, exposing the people of New Orleans to new art, educating students, and developing a new tourism attraction for the city. The Emergency Response Studio will be stationed at various locations around the city until January 18th, 2009. I am still serious about taking this to Beauty out to shows, festivals and handing out Literature so people can look at and tour these and BUY them from you until I see enough to OWN on my self! I kid you not! think on it! Craig Whitworth 121 Walker ROad Morganton, NC 28655 ALSO, my father is a retired Navy man, with TIME on his hands, He has a great wife that loves to travel new places and see new things and places so anytime I had to work, we'd hitch it to truck, My Jeep and show it off to the world. PLEASE consider it. This application so ROCKS!! If there is any way I could possibly get some of the info to do something like this, please! This idea has been sooo long coming and so VERY necessary in these times. My hat's double off to you sir. You are an inspiration to all of us knucklehead exploiters out here. Keep up the good work. After Hurricane Katrina, Paul Villinski, a well-known New York-based artist, wanted to transport his studio to Louisiana to see the aftermath first-hand and create artwork in response. At the time he didn't have a way do it, but since then has picked up a 30' trailer, gutted it, and rebuilt it to be green, non-toxic and off-grid. 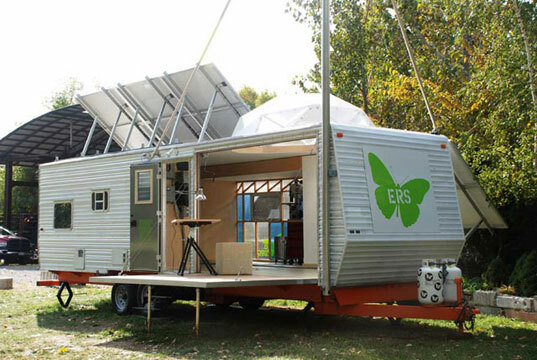 The Emergency Response Studio is now a totally self-sufficient traveling artist studio outfitted with solar panels, a wind turbine, non-toxic furnishings, and plenty of space to create.